JohnAdams is a Legacy Library. Legacy libraries are the personal libraries of famous readers, entered by LibraryThing members from the Legacy Libraries group. » John Adams's legacy profile. JohnAdams is also an author. 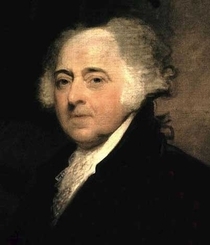 » See John Adams's author page. About meJohn Adams (30 October 1735 - 4 July 1826), Massachusetts lawyer, diplomat, and statesman. Defender of the British soldiers tried after the Boston Massacre, delegate to the first and second Continental Congresses, signer of the Declaration of Independence, ambassador to the Netherlands and to England, drafter of the Massachusetts Constitution, first vice president and second president of the United States of America. About my libraryMost extant books from John Adams's library are currently housed at the Boston Public Library. You can read an extensive history of the collection or explore highlights through the John Adams Library website. Deposited with the Boston Public Library in 1894, the John Adams Library includes over 2,700 volumes collected by the second president during his lifetime (1735-1826) as well as hundreds of additional books later donated by his family members (NB: Books printed after Adams’s death and added to the collection posthumously are not included in Adams's LT catalog). The first published list of Adams's complete deeded library was printed in 1823 in Deeds and other Documents Relating to the Several Pieces of Land, and to the Library Presented to the Town of Quincy by President Adams. This catalog included all volumes bequeathed by Adams in 1822, listing his total gift at 2,756 volumes. One of the greatest private collections of its day, the Adams Library remains one of the largest original early American libraries still intact. This remarkable original collection of 3,510 books spans the fields of classics, literature, history, politics, government, philosophy, religion, law, science, mathematics, medicine, agriculture, language and linguistics, economics, and travel. See also the Catalogue of the John Adams Library in the Public Library of the City of Boston (1917). The collection is of particular interest to scholars and historians because Adams recorded thousands of interpretive and critical manuscript annotations in the margins of his books. Links to transcriptions of his annotations and complete digitized volumes are included in the Comments field for selected books. More information about the collection is available by e-mailing johnadamslibrary@bpl.org or calling 617-859-2379. Collections: The Collections found in this LT catalog indicate copies of John Adams books currently known to be extant, and their locations. Tags: The subject tags found in this LT catalog (Agriculture, American History, Arts and Music, Classics, Economics, Education, European History, Geography and Travel, Language and Linguistics, Law, Literature, Military, Philosophy and Ethics, Politics and Government, Reference, Religion, Sciences, and World History) were added by BPL catalogers (with the exception of the Education subject, which was added during LT-cataloging). In the 1823 catalog of the library as it was deeded to the town of Quincy the books are classified by language, with the format and number of volumes noted for each (the books are in no discernible order within each language). Those language and format tags have been added to the collection as well.